First single “Die & Rise” is also available now digitally at both iTunes and Amazon, and is already receiving early support at SiriusXM Octane and terrestrial radio. The song impacts at Active Rock radio March 4. 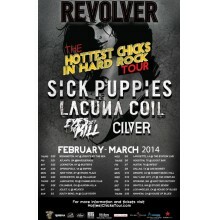 LACUNA COIL are sharing a stage with SICK PUPPIES, Century Media Records labelmates EYES SET TO KILL, and CILVER on Revolver’s Hottest Chicks In Hard Rock Tour, which runs through March 20 in Anaheim, CA. 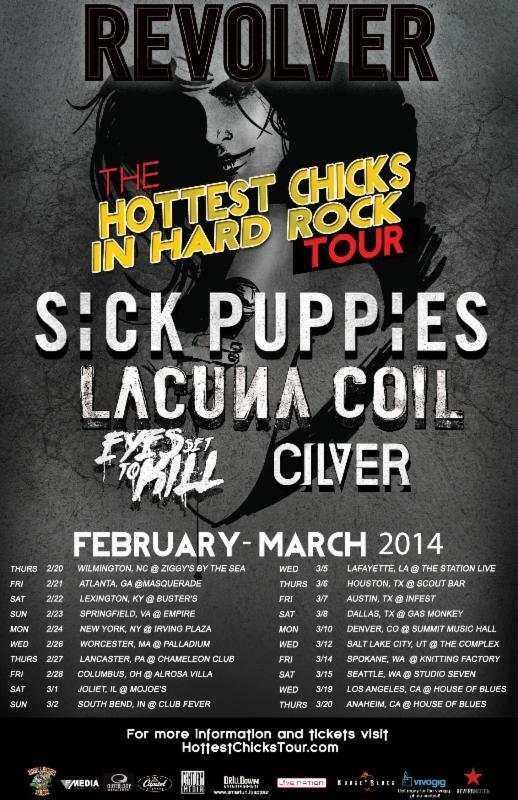 See complete itinerary below, and visit www.hottestchickstour.com for additional details and VIP packages. The tour will not be impacted by the recently announced retirement of Cris “Pizza” Migliore and Cristiano “CriZ” Mozzati – Marco “Maus” Biazzi will play all guitar on the tour, and Ryan Folden will join the band on drums. Fans will already be familiar with Ryan, as he performed live with LACUNA COIL on the majority of the 2012 and 2013 ‘Dark Legacy‘ and ‘Dark Adrenaline‘ tours. ‘BROKEN CROWN HALO‘ is set for releases April 1, 2014 in North America (March 31 in Europe, Australia, New Zealand) on Century Media Records. The album is the band’s seventh studio effort, and the highly-anticipated follow-up to ‘Dark Adrenaline‘, which was released in January 2012 and saw the band tour with acts including Megadeth, Motorhead, Volbeat, Sevendust and Paradise Lost after debuting at No. 15 on the Billboard Top 200 album chart. 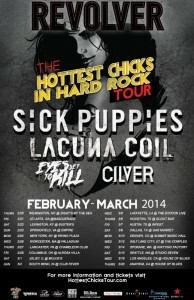 The band will also be appearing on several festivals in spring, including 98ROCKFEST in Tampa, FL, April 25, alongside AVENGED SEVENFOLD, VOLBEAT and FOZZY, and MONSTER ENERGY FORT ROCK and MONSTER ENERGY’S WELCOME TO ROCKVILLE, April 26 and 27, where they’ll perform alongside ROB ZOMBIE, KORN, FIVE FINGER DEATH PUNCH and more. “What conflict could run so deep that it takes you to the deepest corners of your inner world? Today we are surrounded by a lot of lies, aliases, and people acting like they are wearing an invisible crown – but you better have thick skin if you want to wear this crown! ‘BROKEN CROWN HALO‘ is a cinematic album that could be the soundtrack of our days – it is a dark vision of a near future when survival is second nature, and failure is not something to be avoided, but rather cultivated with lessons learned along the way. 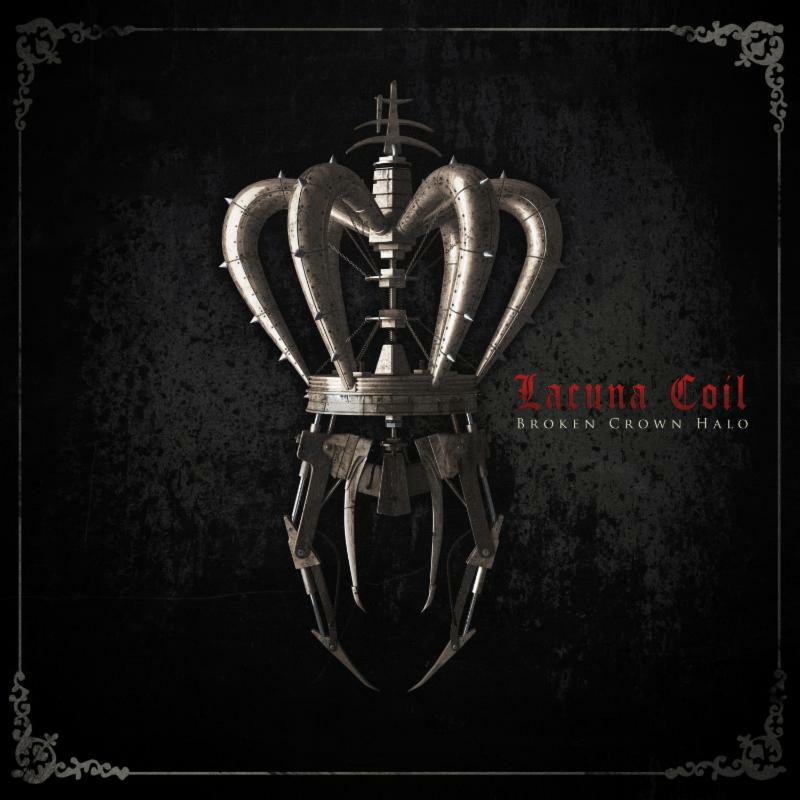 LACUNA COIL were joined in their native Italy by producer Jay Baumgardner [P.O.D., Sevendust, Evanescence, Papa Roach] and engineer Kyle Hoffmann [P.O.D., Bush, Zebrahead]. ‘BROKEN CROWN HALO‘ was mastered by Howie Weinberg, whose credits include Rammstein, Soundgarden, Nirvana, Deftones and Sheryl Crow.